There are over 150 million blogs on the internet and more are being added each day. Blogs are essentially online journals – a way to share your thoughts and viewpoints with your audience. But what should you blog about? The key is posting unique content that is relevant to your audience. Blog topics can include updates about your office, what patients can expect before, during and after a certain procedure, tips for staying healthy. Does it always have to be about business or the medical field? Absolutely not. But keep in mind that your blog is an extension of your practice and your website, so professional blogs should always be positive. 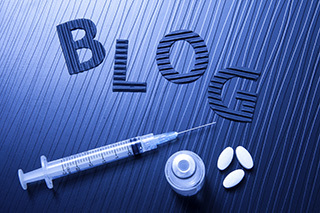 You may be wondering how a blog can benefit you as a healthcare professional. By providing patients with a glimpse of your interests or something funny that happened to you, you are able to establish a personal connection with your patients. It makes you a real person and patients will appreciate a memorable story about their doctor and then may share that story with their friends and family. If you would prefer to keep your blog strictly professional, that’s fine too. You can certainly keep your blog posts all business and educational. Patients are always looking for information about a condition or illness. When you provide that information, they will start to trust you, follow you and talk about you. A blog may improve your website’s visibility on search engines. Search engines like Google value sites that have unique, quality content. Regularly posting blog posts that contain meaningful content can help push your website further up in search rankings. This makes your site and your practice even more visible to potential patients who are searching the web for new doctors. By sharing information, people will be driven to your website over and over again. They’ll get to know your practice, your philosophies, your treatment options, and you. And that’s really what it’s all about.